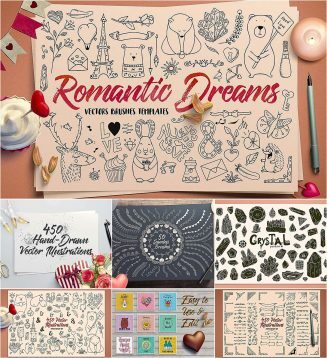 Set of 450 cute hand-drawn illustrations in vector format, 50 vector pattern brushes for Illustrator and 9 easy to use and edit pre-made card designs. File format: .svg, .ai, .eps, .png for Photoshop or other software. Tags: border, card, crystal, doodle, handdrawn, heart, postcard, romantic, teddy bear, Valentine.